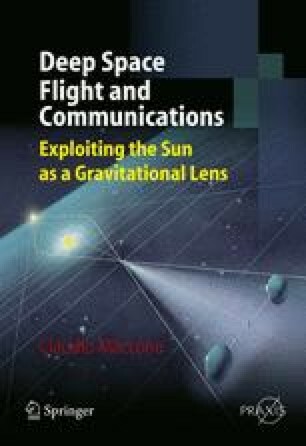 This chapter is devoted to studying the exploitation of the Sun’s gravity lens in a most realistic context—one that was opened up only recently (1999). Indeed, new experimental perspectives were opened by NASA’s decision to set up an “Interstellar Probe Science and Technology Definition Team”, of which the author of this chapter is a member. NASA’s Interstellar Probe (ISP) is expected to be launched in June 2010 and reach 250 AU in just 15 years, being “pushed” out of the solar system by a 400-meter hexagonal solar sail plus a suitable flyby of the Sun. ISP will then explore the heliosphere with its termination shock and plasma (120 AU). The probe direction of exit from the solar system will be toward the heliopause’s “nose”—namely, 16° in declination and 16.6 hours in right ascension. ISP will then keep going along this straight direction “forever”, and will cross the 550 AU focal sphere of the Sun around the year 2040. Could we take advantage of this circumstance to prove experimentally for the first time that the Sun’s focus is there? Yes—by letting ISP carry some photometer or bolometer capable of detecting the influx of the Cosmic Microwave Background (CMB) radiation focused there by the Sun. Also, apart from revealing the Sun’s focus, valuable results for the science of cosmology would be achieved, inasmuch as the angular resolution of the CMB provided by IPS and the Sun’s lens would be about nine orders of magnitude better than COBE’s. To achieve these goals, in this chapter a study of the CMB observing conditions is made and we also take into account the effects of the Solar Corona whose electrons actually tend to “push” the effective focus of the Sun farther out than 550 AU.